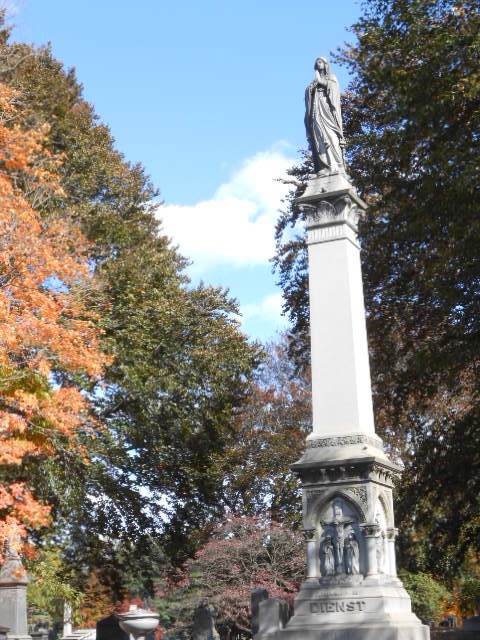 Autumnal Woodlawn Cemetery – No Blinking! 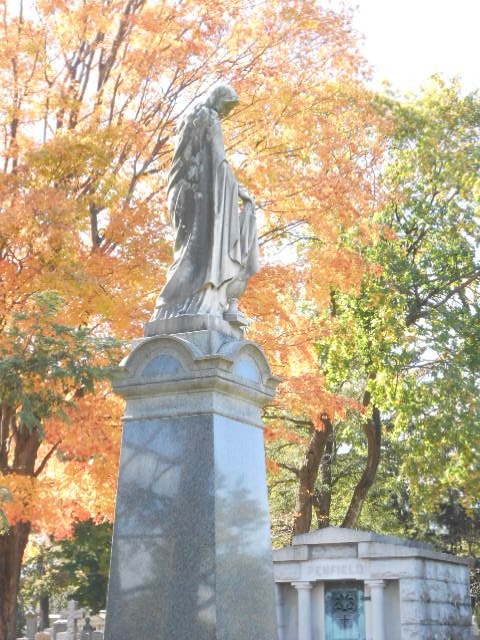 Three years ago, Yang and I took an autumnal visit to Woodlawn Cemetery in the Bronx. This was our second visit. Our first was in the summer, and we took many photos of the gorgeous sepulchres with their ornate carvings of lions and sphinxes, as well as beautiful stained glass inside. This time, with the fall leaves beginning their metamorphoses into vivid colors, we concentrated on the outdoor imagery. 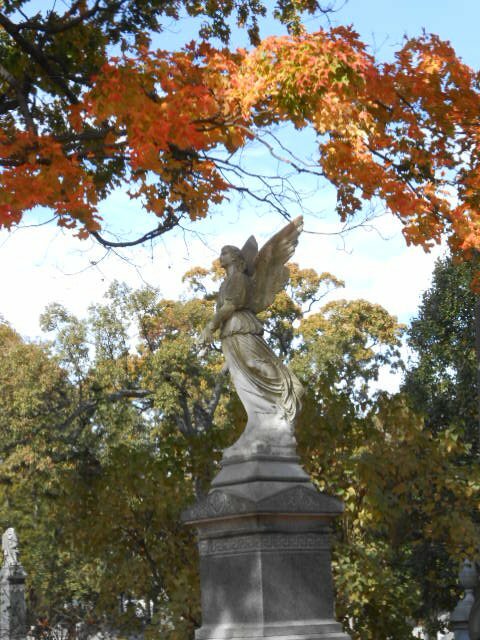 I love the way this angel is framed by the flaming curve of the branch and leaves above it. I also found this figure fascinating, straining for freedom, emerging from his marble prison – perhaps to burst the bonds of the body’s clay and fly away on the sharp wind of the north to eternity. We found this image especially beautiful, the soft orange of the tree leaves providing a brilliant background contrast to the soft grey/white of the stone and the gentle and flowing draperies of woman portrayed here. 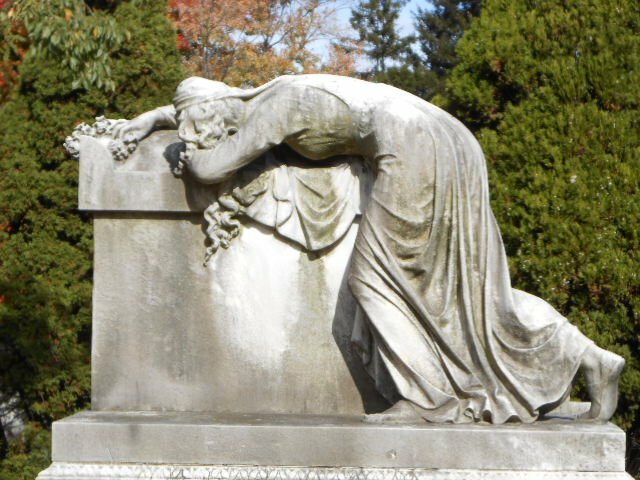 This woman draped meltingly over the tomb stone in her anguish was a deliciously melancholy image to ponder. I actually manged to find a piece similar to this monument from Toscano to add to my own Halloween graveyard in my front yard this year. I’m fascinated by this monument. My guess is that the chap memorialized in Roman senatorial garb must have been a judge or a high political figure. I hope he met a better end than Julius Caesar! I thought the warm orange of the tree behind his imposing statue made an appealing contrast. Stern but not harsh features on this chap. 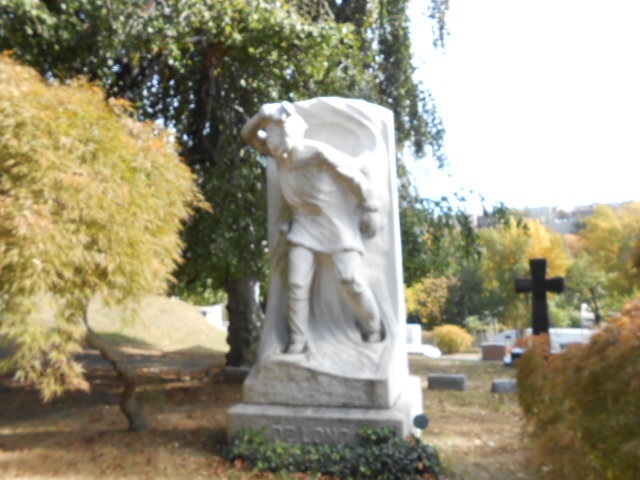 Happily, we found a wonderful living denizen in the cemetery. 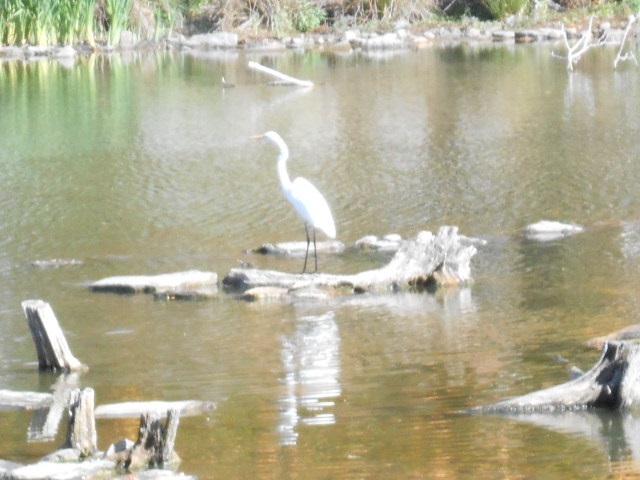 Woodlawn also contains a beautiful reflecting lake, and this Great Egret found it just the ticket! Of course, he was probably more up to fishing than reflecting – a bird’s got to eat! 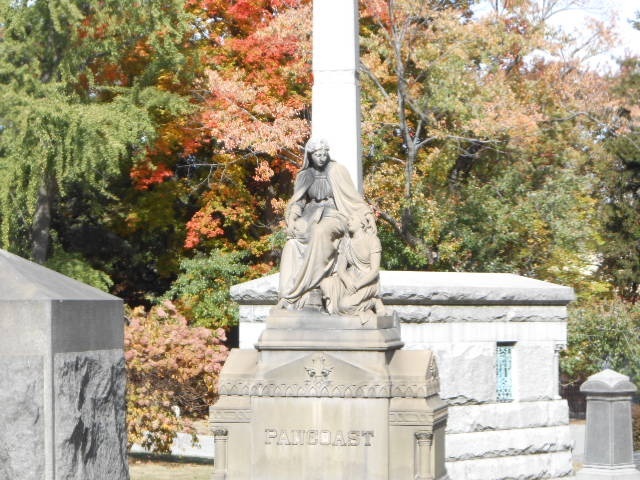 There were other typical Victorian monuments, wonderfully complemented by the fall colors. Here is a mother with her children. One hopes this is not a comment on the high mother/child mortality rate but rather a celebration of deep feelings between parent and children. 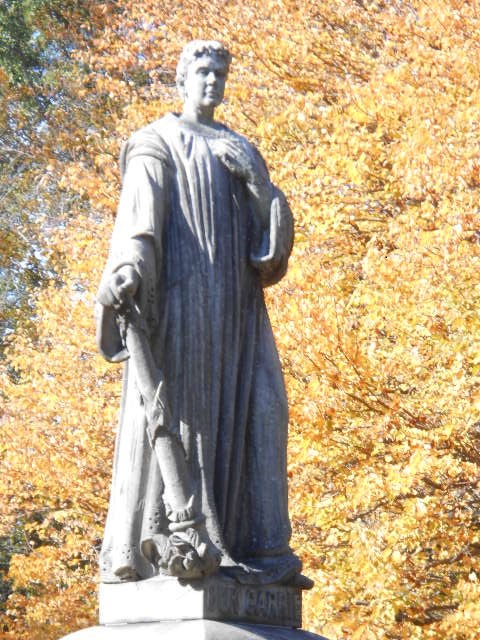 I was intrigued by this praying woman, high atop her monument. She almost has an aspect of the Catholic Virgin Mary, not what you would expect in a seemingly predominantly Protestant cemetery. Again, the autumn trees provide a pleasurable contrast to the cool white and grey-aged stone. This cemetery is indeed a pleasure to stroll through, just be sure to bring your camera – whatever season you visit! Here’s a link that gives you a virtual tour. I was just upstairs watching “A Haunting”. This episode had a haunted attic. Long story short…I did not watch it to the end. I put on Family Guy to get me out of that show. They are beautiful pictures that leave little tears in your heart… Its like an assault that you are unaware has happened until you’re done…. The foliage was beautiful and warm to look at while framing the cold stone works of art. Very nice work with the camera. I don’t find them as disturbing as I did last night. Did you capture any lost souls with your camera? Your novel has a serious tone to it using the other voice. I have also noticed that it rings true in this era too.